Tommy Wu is a modern-day Lowthario. In 2008, he's acknowledged as China's perhaps preeminent designer and maker of wideband drivers and the speakers that run with them. Unlike Lowther devotees who rely on semi-vintage drivers that remain in current production, Tommy Wu has studied modern and vintage wideband units for many years to decide on rolling his own instead. Now he operates a sizable factory and already counts one very high-profile UK speaker house as OEM client for his JohnBlue Audio Art drivers. David Kan's review of Tommy's JB3 compact monitor is an excellent and very informative read on this 5-year old company, its inspired principal and the -- frank and critical -- conversion of Doubter David to this far from common kind of loudspeaker. It even includes an assessment by his daughter and the above sidebar. And the following: "The headquarters of JohnBlue Audio are in the Southern city of Huwei, Yunlin County, with a 2-storey factory that occupies 2,000 s.m. and houses approximately 100 employees. 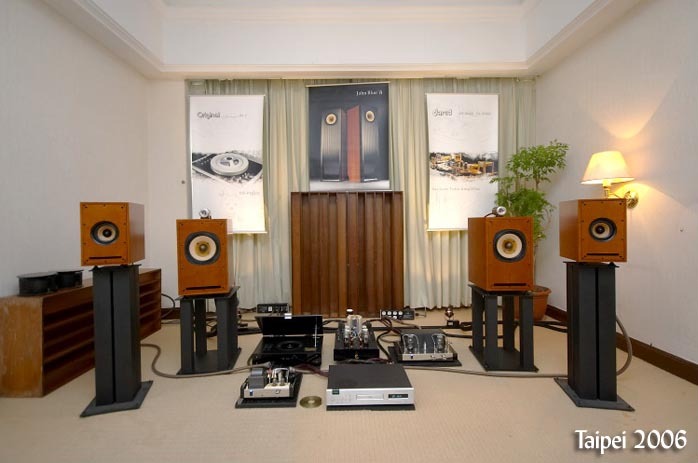 The production line includes full-range speakers and drivers, super tweeters, tube amps and cables. Says Tommy: "Every production process is handled inside the factory and never has been nor ever will be farmed out. All transformers including output transformers are proprietary designs and hand-wound by us to very stringent specs. Crucial components like coupling capacitors are semi-finished import products that are modified and finished according to our requirements"." The super tweeter mention above keys us in that Tommy Wu is not the kind of silly fundamentalist who'd consider it a breach of widebander etiquette if one augmented treble extension with a second driver. Which neatly segues into today's review subject, Tommy's most ambitious speaker model of his present four. It is called the JB8 in reference to its 8" driver. Now wideband religion includes a very basic tenet. It says that you can either go to hell or heaven but not both. A bigger driver will do sufficient bass to sound competitively grounded compared to traditional multi-driver expectations. A small driver will keep up with conventional tweeter units. But the big driver will suffer premature treble death, the small driver no bass to speak of. At present, there is no driver on the market which covers 40Hz to 20kHz to be considered a true fullranger. 20 to 20? Fuggedhaboudid. From its 8-inch diameter, we know that JohnBlue Audio Art's JB8 is a hellacious, not heavenly model. An 8-incher will optimize extension in the low end rather than treble. 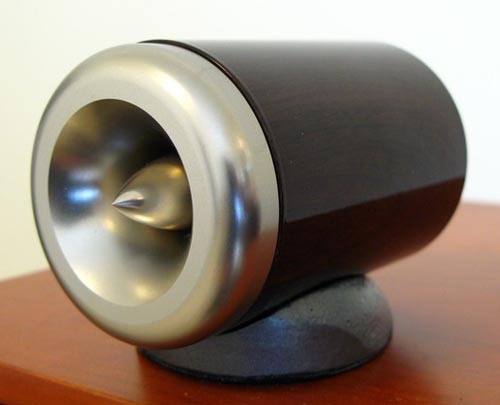 Might we assume it to be a tailor-made candidate for Tommy's own Aluminum/Magnesium super tweeter? Glancing at photos on page 2 of this Full Range Driver Gallery, one indeed finds both of JohnBlue's 8-inch models shown that way. Cheers to sensible pragmatism. 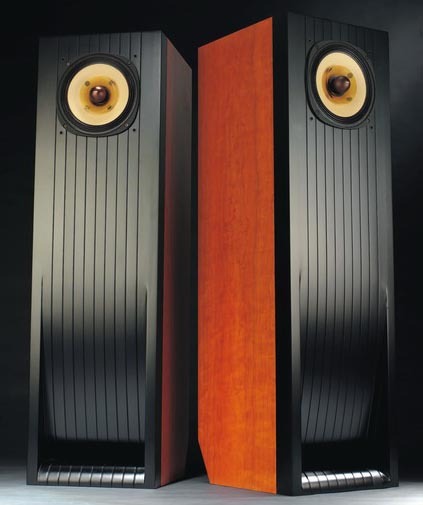 In the speaker's published specs, we find a similarly pragmatic 93dB sensitivity. This is not the 98 to 101dB figure often associated with so-called hi-eff widebanders. It could imply very level-headed practicality that wants to avoid certain concessions which are nearly inevitable when one pursues extreme driver efficiency. 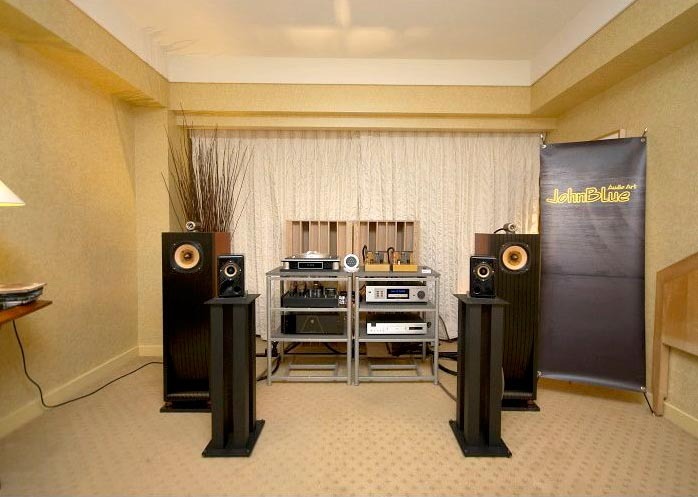 Tommy's four-square speaker lineup uses the 8-incher also in the JB8B monitor model [bigger one above] compared to which the floorstander adds more complex cabinet loading to optimize the low-end extension. The enclosure panels use 24mm high-pressure bonded MDF with internal damping layers and sub chambers to suppress acoustic and mechanical resonance. The machined and grooved Plywood baffle curves inward at the bottom to form a vertical slot that might be the mouth of an internal line. The sides are laminated in solid hand-buffed Cherry veneer. Outer dimensions are 1050 x 300 x 260mm HxWxD with 45kg of mass. Internal hookup wiring is Danish 1.9mm solid-core silver, with the KingRex folks one of the global distribution partners. 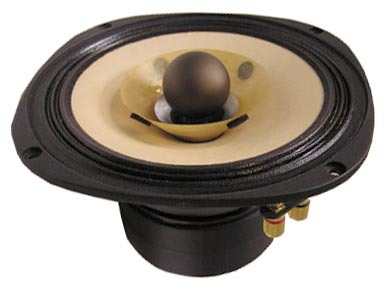 Purely based on photos of the JB8 driver, one sees a Lowther connection with pleated surround ties to Altec and a bow to Fostex with the super tweeter. Now add Tommy's own 6wpc valve amp, CD player, CD mat, cables, his own speaker terminals, OEM driver manufacture. There's a lot more here than just another exotic transducer maker at the outermost fringe of the audio mainstream. Which vintage or modern wideband drivers did you model yourself after, were inspired by or felt were the ones to beat, either all around or for specific qualities when you set out to build and design your own? name just a few of all brands you could think of. We purchased, tested and auditioned them all before developing our JB drivers. Why did you decide to not pursue extreme efficiency such as Lowther for example? The reason why each JB speaker from the JB3 and 4 to the 8s is lower in efficiency than conventional widebanders (87dB for JB3, 89dB for JB4 and 96dB for the two 8s) is that not all consumers are tubophiles. It is not within our control as to which components are used to power our JB speakers - tubes or transistors, high power or low. Our design philosophy is system synergy. Not every user is competent in system matching. For most, it is trial and error or sheer luck. If the driver efficiency is high, matching the right component can be an arduous task. 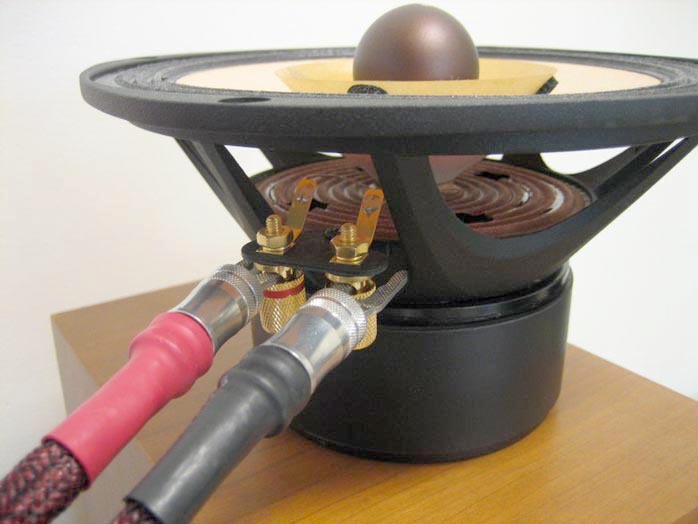 Solid state plus high sensitivity can result in an unduly harsh and edgy sound. The sensitivity of the JB speakers facilitates a wider choice in pairing equipment and thus better system integration for the end user. Among our customers, amplifiers used range from single-ended 2A3s, 300Bs and even extreme low wattage 0.8-watt 5687 tube amps to 100wpc Electrocompaniet transistor amps, all with exhilarating results on the JB8. What can you tell us about the 8-inch driver in particular? It appears to be a double whizzer affair with an inner silver one and an outer yellow one with four dots. Incidentally, what are those dots for? Our 8-inch driver consists of 2 whizzer cones and a main cone with a central phase plug. The first whizzer has 4 small dots and its purpose is to control midrange 'thickness' while the dots are dampers to suppress excessive resonance. If this whizzer is elongated, the sound gains in fullness, when it is shortened, the sound becomes leaner. The second whizzer is the silver-colored part while the innermost phase plug is constructed of a proprietary, unique and advanced material just like the JB3 driver. The design philosophy behind the JB drivers can be explained with an analogy: A single driver is like a balloon filled with high, mid and low-mass gas, assuming the three different gas masses are of equal volume. If I want emphasis on the high frequencies, the only way this can be done is to suppress the low-mass gas in the balloon. So in sound reproduction, the lower octaves will be diminished but the highs will improve. Lowther drivers are famous for their sweet mids and extended highs so like in my analogy, their lower frequencies are sacrificed. Bass from widebanders requires large and well thought-out enclosures before it can be realized. Why not 16-ohm but 8-ohm drivers? Most tube amps' output impedance is now 4 or 8 ohms or a combination of both so we specifically designed our driver to be at 8 ohms. When connected to a tube amp's 4-ohm tap, the sound will be more robust but not as refined. The reverse is true when connected to the 8-ohm tap! The JB8 vents out the front in what appears to be the possible terminus of a transmission line. What can you tell us about the innards of the cabinet and the path way of the drivers' rear wave? I will send you the internal pics of the cabinet. The damping used within is a proprietary material pioneered and developed by JB. As an 8-inch widebander, this speaker seems tailor-made for your super tweeter. Is that's what you would consider using for best performance? synergized. Even our 4-incher can be paired with the ST-100. Conventional multi-way speakers too can be enhanced and their performance improved with our super tweeter. We have A/B'd our unit against the likes of the JBL 077 and 2405 and I can confidently conclude that it is comparable in performance. Vis-a-vis the Fostex 900A, ours is far superior as unlike the F900A, we did away with VR for volume control. The use of VR adds unwanted interference and distortion. Our approach to the frequency division works on a similar principle to the renowned Tannoy ST200. that's higher than the JB8. How do you achieve the best match? preference is to turn on switch 1 and 2 on the super tweeter. 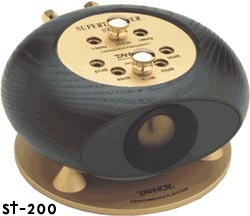 Does the super tweeter use any compression loading? If so, what is the ratio? We use compression loading and spent a lot of time to develop it so that will have to remain our secret. The JB super tweeter taps its signal from the main speaker and comes with 3 sets of switches to fine-tune amplitude and frequency coverage to match all speaker types for an immediate, direct upgrade of their acoustic performance. The high-pass filter sits at either 14 or 17kHz (positions 2 and 6 respectively) and the switch settings allow for 8 different combinations. With all three switches 'on', the cut-off is lower, output highest. With all three switches 'off', cut-off raises and amplitude is at its minimum. Output levels are controlled by a proprietary crossover network, not L-pad. Each super tweeter pair is precision matched and enclosed in a hard-anodized aluminum cylinder, with copper core induction ring, neodymium motor, high-purity copper wiring and a 16mm diameter, 2-layer aluminum voice coil. The tweeter diaphragm itself is 16mm in diameter as well and composed of an aluminum/magnesium alloy whose free-air resonant is 3000Hz, moving mass undisclosed. Power handling is 40 watts nominal, 60 watts peak. The neodymium motor is 30mm in diameter and 15mm in height. Music consists of transient micro detail and rich harmonics beyond the human hearing range. Bass notes for instance contain leading edge transients approaching 30kHz. The JB super tweeter enters the picture between the roll-off point from the tweeter of one's existing loudspeakers and 43kHz, with pinpoint-accurate reproduction of the leading edge of individual notes. This allows the listener to be enveloped by the entire bandwidth information of instruments. It helps correct time and phase response within the bandwidth of normal human hearing. When operating beyond the range of human hearing, the net effect is a realistic soundstage due to improved imaging and instrument localization. In conclusion, JohnBlue Audio Art is the house brand of Tommy Wu's driver manufacturing plant in Taiwan. This particular 8" driver was born many years ago and experienced many iterative refinements. When Tommy felt that this and the companion 3" and 4" drivers had finally been perfected to compete against all other known widebanders in the market, he established his JB Audio Art brand. "As you know, creating the perfect cabinet for a widebander is very difficult but supremely important. The driver alone contributes at most 50% to the final sound. The rest is the enclosure. I think the JB8 is perfect in this enclosure." 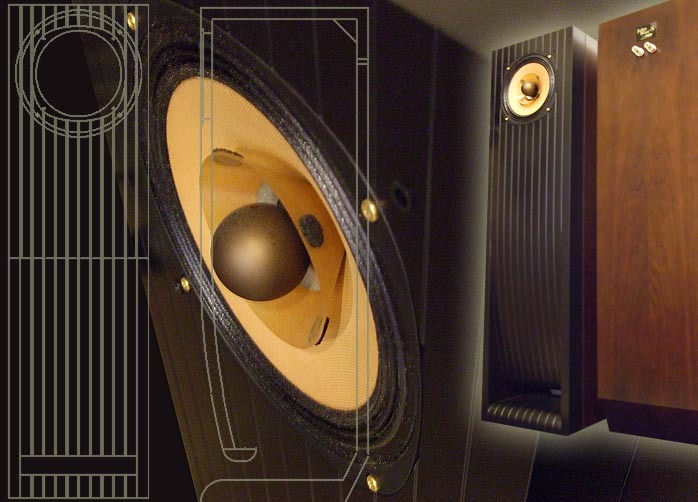 The JB8 and JB8B speaker models are thus also proof-of-concept creations. They demonstrate the drivers' performance in what Tommy considers their very best light. He sells his drive units to many "famous brands" as an OEM supplier. With JohnBlue Audio Art, he finally pursues open recognition for his driver design/manufacturing chops, a satisfaction that eludes most Pacific Rim transducer makers. After all, Western consumers recognize for example Dynaudio drivers as quality units, hence speaker makers proudly announce their use. Consumers wouldn't recognize Tommy's own units. The moral of this story simply is that if you're a Chinese or Taiwanese driver manufacturer who desires open consumer recognition, you must launch your own loudspeaker brand and compete globally under your own name. That's how Taiwanese giant Usher has done it. That's what Tommy Wu has now set out to do. As JohnBlue Audio Art.